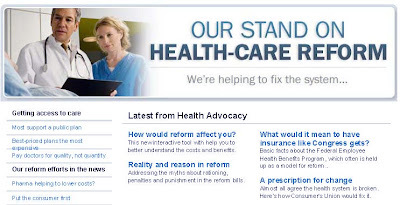 (Note: CR's general website has numerous health care related pages; I have limited my review to the health care reform website and related links being promoted by CR as part of its public relations effort -- partial screen shot below -- since this is the site most consumers would consult as to CR's health reform position). But the survey at the heart of CR's position was taken several months before there were any concrete Democratic proposals on the table. House Bill HR3200 was not issued until July, and we still are trying to find out what the full Senate will propose. So the heart of CR's policy position on health care reform, the public's supposed support for a public option, is at best questionable, and at worst misleading. And the entire presentation lacks any semblance of balance, thereby depriving CR readers of the opportunity to weigh competing views. Were this a position paper by a Democratic advocacy group, such lack of balance might be acceptable. But CR holds itself out as an advocate for providing consumers with information as to the good and bad aspects of products. Unfortunately, CR has exempted Democratic health care reform proposals from CR's usual analytical standards. What is surprising, again, is that there is little attempt to discuss possible negative consequences. For example, at page 3 of the document CR has a chart showing an "overview" of what will happen under Democratic health reforms proposed as of July 2009. At the top of the chart, it asks "Do you have employer provided coverage?" and then an arrow to a box which says "Coverage Continues." But as noted, this is a hotly contested issue, but one would not know it by reading CR's chart and profile discussions. This is a critical issue considering that an overwhelming majority of Americans are satisfied with their existing insurance coverage, yet CR glosses over coverage issues by presuming that everyone happy with their current coverage could continue that coverage. On page 4 of the profiles, CR addresses a family ("the Taylors") with "good coverage through employer." Again, there is no attempt to address any negative consequences of Democratic proposals. CR presents only the upside. This is consistent for all the profiles. What would it mean if we all got benefits "as good as Congress gets"? The Federal Employee Health Benefits (FEHB) program is often held up as a model for health reform. The idea has a nice ring to it: "Everyone should have health care as good as members of Congress." This fact sheet summarizes some basic facts about this program. FEHB program is generally considered to do a good job providing coverage, but it’s certainly not perfect. CR's trumpeting of the FEHB is highly misleading, and likely leads many readers to think they will be getting coverage similar to FEHB under the public option. Yes, CR does not say so explicitly, but it also does not say that FEHB has nothing to do with pending proposals. This tactic of highlighting FEHB, both through placement on the page and language used, is the sort of bait-and-switch tactic which normally gets CR's ire. Under a link called Reality and reason in reform, CR says it will address "the myths about rationing, penalties and punishment in the reform bills." The first "myth" addressed is that the health care proposals will lead to "rationing." But CR sets this up as a strawman argument, addressing an issue (hospital readmissions) which does not go to the heart of the rationing debate. The health care mandate covers everyone, even those who would prefer to and can afford to pay for health services themselves. The concept of health savings accounts (i.e., catastrophic insurance coverage) would be eliminated since such accounts would not be "acceptable" coverage. The notion of self-reliance would be destroyed, but to read CR's explanation, anyone who wants to rely on themselves is shirking a societal responsibility. This may be an argument, but it is a completely one-sided argument the way presented by CR. And considering that CR is tax-exempt, it hardly is in a position to be lecturing the rest of us about our shared responsibility. CR addresses other issues, and I encourage you to read for yourselves. I think you will find that CR has taken on a pure advocacy position for the Democratic proposals, and does not attempt to present contrary information, such as insurance industry reforms which accomplish many goals without restructuring the entire health care industry. CR's attempt to justify higher taxes on the wealthy to pay for all this ignores the reality that there are not enough rich people to pay for massive health care spending, and all the other spending proposed by the Obama administration. CR has stepped out of being a provider of unbiased information (both good and bad) to empower consumers to make their own informed decisions, and has become a political advocacy group which seeks to minimize the legitimate arguments against the current Democratic proposals. If that is what one was expecting from CR, that's fine, but that is not how CR presents itself to the public. It is nothing short of amazing how many agencies/groups/individuals have decided to throw everything overboard and dive into the tank with Obama. Amazing... and more than a little scary.